MISSION, Kan. – It’s the new trend in working out. And it doesn’t require lifting weights or running on the treadmill. All you have to do — is fly. “It’s like Pilates in the air, weight training in the air, it’s yoga in the air, it’s everything, one workout. I was just amazed and I knew that I had to bring it to Kansas City,” said Sumya Anani, the owner of a Mission, Kansas gym called Learning2Fly. After a long career in the boxing world, Anani opened the gym about five years ago. 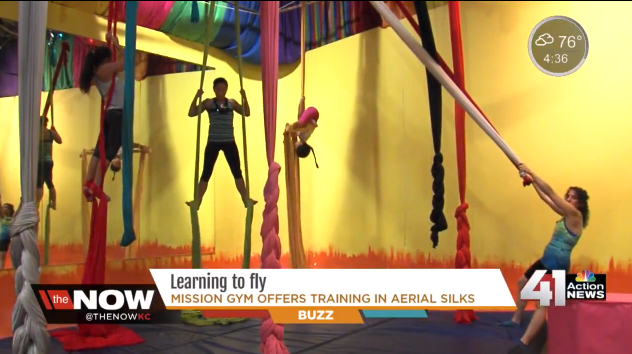 Using so-called “silks” gym goers can lift themselves into the air, then depending on their skill level, perform various aerial fitness routines. In 2010 pop star Pink brought this type of aerial skill to public attention, with a memorable performance at the Grammy Awards. “She’s an amazing athlete,” said Anani. “She really brought a lot of notoriety to silks and people are like oh where do I do that,” said Anani. Soon after Pink’s performance, “silks” were popping up in more gyms across the country. For Andrea Andrews and her daughters it’s a fun and challenging activity. Andrea enjoys it so much she started teaching classes at Learning2Fly. Learning2Fly offers classes for people of various skill levels. There are also classes specifically for children.